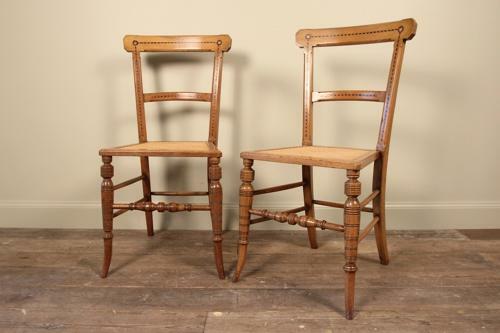 A pretty pair of Aesthetic side chairs, made in solid Ash with decorative Ebony and Satin wood inlay, having cane seats of which are in excellent order, raised on ring turned tapering front legs with spayed back legs and all adjoined by stretcher rails. Perfect bedroom or hall chairs in good original condition thoughout. English, Circa 1880.